The subway system as art. I remember back in 2009 when we visited New York I was afraid of the subway system. I can still see the images that it conjured in my head; as I walked past the countless stairwells I imagined they lead to what was surely a scary dungeon full of criminals and vagrants. It didn’t matter that I saw all sorts of people going down and coming up the stairs. People in business attire, young kids, tourists, people with strollers. But now – I can hardly imagine a world without the system. I love it underground. I look for interesting architectural features and I read about the history of the system. I wonder how long a particular tile has been attached to a particular wall. I make note of how deep underground we are. Once we rode up 5 escalators to reach the surface! In some ways the system is like a museum. An ode to New York perhaps. Different stations feature different artwork. 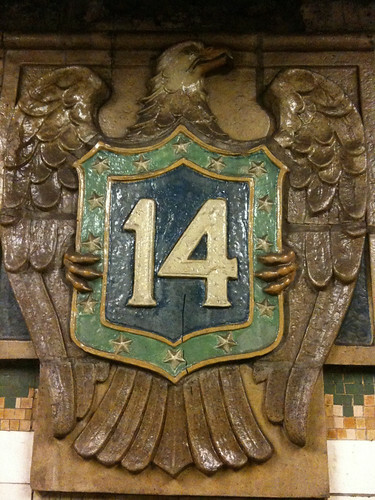 50th street has Alice in Wonderland, 23rd has hats, 72nd has a 3D likeness of a fossil embedded in it’s tile walls. I am trying to snap a photo in every station I land in and hope to share them soon to help de-mystify the underground world that is the subway system. It’s this amazingly complex web of tunnels that connects all manner of people with precise timing and super speed forcing steam to the surface and people to their destinations. The trains themselves are like art and some of them make music! 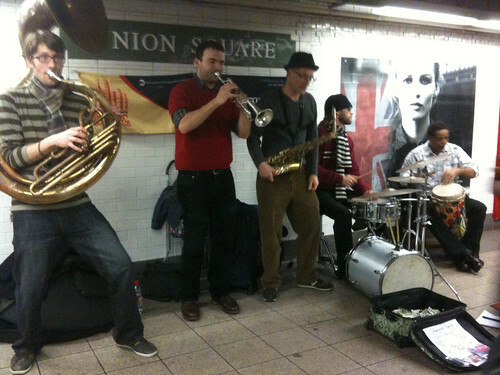 There are many articles and videos demonstrating the sounds of the subway. One NYTimes article still stands out in my mind describing how a particular train seems to make the music for a song from “West Side Story.” But then there is the official music provided by the MTA: “Music Under New York,” which offers various artists a chance to perform before a live audience and gives passengers a chance to experience a little art in our concrete jungle. Of course there are also musicians that ride the rails panhandling for a song and just last week I saw a very beautiful girl at Grand Central near the S train playing the violin. Standing just 5 feet away from her was an older man in an overcoat and an over-protective look on his face. I imagine he was her father, keeping an eye out for his daughter as she performed before rushing commuters and roaring trains. Perhaps cutting her teeth on live performance? If she can handle the subway system she can handle anything. This entry was posted in everything i've blogged, observations and tagged subway, Train, Union Square. Bookmark the permalink.